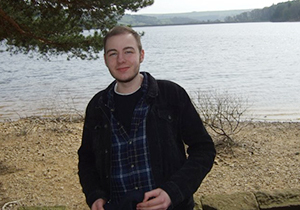 Chris was first diagnosed at the age of eight after feeling unwell for three months. He began to wake up with a headache and then started to vomit sometimes up to six times a day. Chris was admitted to hospital but was discharged only to be re-admitted as an emergency a week later. A CT scan revealed a large mass in the 4th ventricle of his brain and he underwent a 4-hour operation to remove the tumour. The operation was successful and Chris then had six weeks of radiotherapy. He made a good recovery and returned to school full-time. At the age of twelve, Chris began to get excruciating pain in his hip. An MRI scan revealed a tumour in his spine just below the shoulder blades. The cancer had recurred and spread from its original location. For the next nine years Chris fought through forty more tumours in the brain and spine having many surgeries, courses of radiotherapy and chemotherapy. In spite of all the treatments, Chris lived life to the full. Chris has astounded us all with his courage and dignity even after being told at the age of fifteen that his cancer could not be cured. For the next six years he tried every treatment that was offered and carried on with his life as best he could. He was never one for drawing attention to himself or his illness preferring instead to just 'get on with it'. Chris was committed to helping others with this disease. He would help raise funds for any treatments that could help fight his tumor with any surplus going to ependymoma research. Chris was also involved in the first annual Ependymoma Awareness Day in the UK and was thrilled the day had been established. 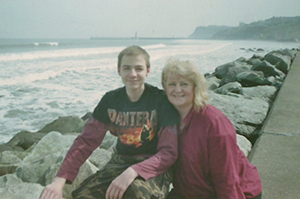 Sadly, Chris lost his battle with ependymoma in January of 2013 at the age of 21. It helped him immensely that others were interested in researching his type of cancer, however, and it is for this reason that we have carried on in his honour our search for a cure. In December 2013, we decided to create Fighting Ependymoma, a non-profit organization that gives hope to children fighting ependymoma brain tumours. The organization supports world class research to improve outcomes for these children. Since becoming a registered charity in February 2015, the organization has made a significant impact on the fight against ependymoma. We were able to donate a total of £107,500 ($137,000 U.S. dollars) to Professor Richard Grundy, Professor of Paediatric Neuro-Oncology and Co-Director of The Children's Brain Tumour Research Centre, in Nottingham. To improve outcomes from ependymomas, he wants to better understanding of the underlying biology both at diagnosis and relapse. This is essential to inform the prognosis and design of tumour specific treatments. “The aim of this project is to use cutting edge molecular profiling to identify genetic factors that may predict an increased risk for recurrence at the time of primary diagnosis and to develop novel therapeutic approaches aimed at improving treatment options at relapse or ideally preventing relapse from occurring,” shares Dr. Grundy. To this end, Fighting Ependymoma has also supported Dr. Tim Ritzmann, a Clinical Research Fellow, using data from 194 children with recurrent paediatric ependymoma to help identify genetic factors that may predict an increased risk of recurrence at the time of primary diagnosis. 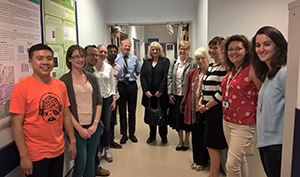 This research has revealed some interesting leads and Fighting Ependymoma was delighted to be able to further help support leading brain tumour researcher, Dr. Hazel Rogers, establish a new project expanding on the data analysis previously started by Dr. Ritzmann. Dr. Rogers will be looking at identifying changes in DNA methylation at recurrence, generating pilot whole genome sequencing data as well as alterations in the immune system. We were also pleased to support Dr. Julie Allard, a Clinician Scientist trainee from the renowned institute of Gustave Roussy in Paris. Her laboratories are working with Professor Grundy to look at alterations in a specific protein, which may help target treatments in the future. We continue to learn what ependymoma research is being done and where Fighting Ependymoma can help. I’m determined to continue to make a difference in Chris’ memory and make sure that every child deserves a bright future.